If you have thoughts about hiking the trail, or any overnight backpacking this is a great read. It reminds us we’re all human and details the reality of the experience, good and bad. Most importantly, it enlightens into the real reason people do this…for happiness…to learn about themselves, and to adventure. And along the way, you encounter people just like you or not anything like you and you make friends for a lifetime. This book takes you along and leaves you feeling good and wanting to get out there yourself. Simply stated – buy this book. It’s a great read where the author makes you feel everything he’s feeling and puts it into a conversational tone. It’s filled with humor and adoration for his trail family and incredible gratitude for every intertwined event the universe laid before him then and now. Adventure On!….and keep writing!! I’m grateful for the reviews and for all of you who have bought the book, thank you!! Some posts about the Appalachian Trail! 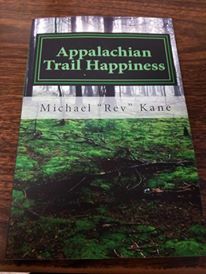 This entry was posted in personal happiness and tagged appalachian trail, AT2018, backpacking, be happy, happiness, happy, hike, hiking, optoutside. Bookmark the permalink.